“Inspiring and informative – this is one conference you don't want to miss. "Superior to any other conference"
"The best conference I've ever attended"
Wendy Mullen, Chief Human Resources Officer, First Manhattan Co.
"Valuable time well spent with senior colleagues in similar roles"
"The right size and the right seniority"
"Open, honest and invaluable dialogue"
"A motivating experience, the content was highly relatable"
"We’re all on our own transformational journey, but the chance to hear how others are accelerating towards the intersection of technology and financial services which LEAP HR: Financial Services offers is uniquely valuable." “The rate of change is accelerating internally and externally, and that means we need to be more agile than ever to anticipate what’s next. 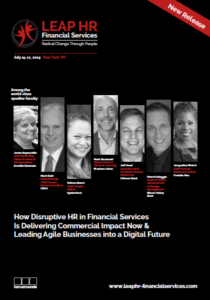 LEAP HR: Financial Services helps us do just that."